Inglehart's thesis of value change is one of the most widely discussed accounts of social and political change in advanced Western nations. 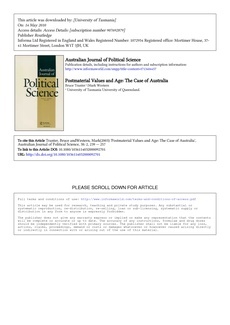 This article offers a critique of Inglehart's thesis and a clarification of the Australian case. While critics of Inglehart have attacked the validity of his values measures, or sought to improve them, we use Inglehart's own values index to show that even if--as Inglehart claims--his measures are valid, the age/values predictions do not hold as the theory suggests in Australia. In a recent article, Inglehart and Abramson (1999, 673) cite Australia among a group of '28 high-income' countries that exhibit 'stronger relationships between values and age' than found in the United States. We dispute Inglehart and Abramson's findings in relation to Australia. We show that the relationship between age and values in Australia, like the United States, is very weak, highlight the problematic nature of assuming a linear relationship between age and values without evidence, and discover a new non-linear relationship between values and birth cohorts in Australia that has implications for the study of values research internationally.